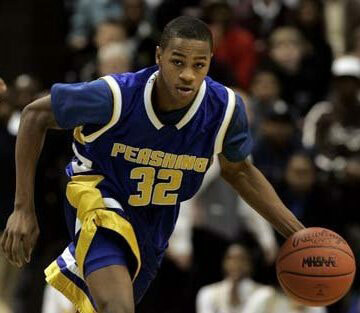 In the 30 years that a Mr. Basketball award has been presented in Michigan, no team has laid claim to the title more than Pershing High School and no league has had more representation than the Detroit Public School League. Keith Appling, who helped lead Pershing to consecutive PSL, City and Class A district boys’ basketball championships, added to that rich legacy Monday when he was named 2010 Mr. Basketball by the Basketball Coaches Association of Michigan. Appling, a 6-2 senior guard, was presented with the prestigious Hal Schram Mr. Basketball trophy at a press conference hosted by the Detroit Free Press. The award is named for the late, long-time Free Press prep sports writer and has been presented annually to the top senior boys’ basketball player in the state since 1981. Appling is the second consecutive honoree from Pershing High. The Doughboys’ Derrick Nix was the 2009 Mr. Basketball recipient and is now a freshman center playing in the NCAA tournament “Sweet 16” for Michigan State University. With online voting used for the first time and points awarded on a 5-3-1 basis for first-, second- and third-place, BCAM members overwhelmingly chose Appling. His 2,037 points easily outdistanced Mt. Pleasant’s Trey Zeigler (1,145). As the top returnee from last year’s Class A state championship team, Appling led the Doughboys to a 22-3 record this season, averaging 28 points, six rebounds, five assists and three steals a game. He will join Nix this fall at Michigan State. Appling, a three-year starter, elevated his stature to legendary heights last season when he scored 49 points in Pershing’s state championship victory. He said he never thought about winning the Mr. Basketball award. Pershing High has now produced four Mr. Basketball winners, including Winfred Walton in 1996 and Willie Mitchell in 1994. Ten, or one-third of the 30 recipients of the award, have hailed from Detroit PSL teams: They include Southwestern’s Antoine Joubert (1983), Chadsey’s Demetreus Gore (1984), Cooley’s Michael Talley (1989), Murray-Wright’s Robert Traylor (1995), Redford’s Dion Harris (2003) and Redford’s Corperryale Harris (2007). Accompanied by his mom, Tottie Collins, Appling fielded media questions and posed for pictures before he was whisked away for an exclusive Free Press photo shoot. His coach marveled about the player he’s seen grow up. “He’s just a fierce competitor who does anything it takes to help his team win,” Canada said. “And he’s a humble kid, too. There’s no one who deserves this honor more than he does. He not only excels on the court but also in the classroom.